I can’t claim that I take excellent notes, but I like them, I use them, and I can at least say that, ever since I was in grade school, my classmates wanted to copy my notes. For me, they were, and continue to be, a source of pride. I always wanted to be the one having the best notes of my entire cohort. I took handwriting lessons, and I observed how other people wrote so that my own handwriting became neater and prettier. When I studied chemical engineering as an undergraduate, I drew distillation towers and reactors using different color pens, and solved all my partial differential equations using mechanical pencil, all the while underlining or boxing results with red ink. I love handwritten notes. Through the years, I’ve continued to feel proud about my notes, and my note-taking ability. Sometimes, it weirds me out when a few of my own students don’t take notes, to be perfectly honest. There is a lot of discussion in the educational technology community about whether we should let students take noteson a laptop or whether they learn better writing by hand or not, about how challenging it would be for some students with learning and cognitive issues — and this IS an important issue to consider, particularly those for whom handwriting isn’t possible because of disability issues, etc. I am not going to engage with that discussion because I don’t study this field and I have absolutely no scientific answer for that – Mueller and Oppenheimer 2014 do provide some scientific evidence. I do believe my students sometimes need laptops, but a portion of the time it creates opportunities for distraction – but that’s not the point of this particular post. I always assume that when my students don’t take notes it is because they are paying attention to the material I am delivering (I prefer to trust my students than to doubt them). I used to give out printed copies of my Power Point slides (which I don’t do anymore) so that my students could write on the margins (Power Point has a printing feature that shows the slide and provides space to the right, where you can jot thoughts and commentary. Since I don’t actually do research on how to take notes, I started looking for material, and researching it, and found a lot of conflicting advice. I shared my concern and received a very relevant response by Dr. Pat Thomson, someone I respect a lot on the topic of academic writing (and learning, in general). Some of the advice I read may be grounded on scholarly research, as Pat makes a good point, but other pointers in those websites seem to be simple heuristics turned into God-given advice. Though I have to admit I love The Conversation, which is an online magazine reporting on issues, but based on academic research. Claire Brown’s post on note-taking hit home with me. 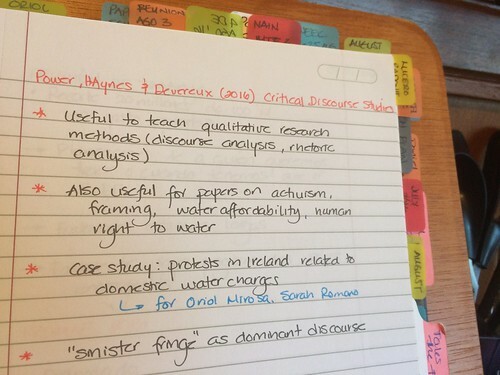 She teaches the Cornell method for note-taking (which I have tested but decided not to continue using), and it seems effective. There are a few things I have noticed about my own notes that I think help me think better. 1. I always note the date. This helps me link what I taught or listened to to a specific date. I find that despite the neat organization system that my Everything Notebook provides me, I need to understand material in a sequential, time-wise manner. 2. I always use colours. This is obviously hard for people who are colour-blind, but I have noted that using different colours helps me retain better. 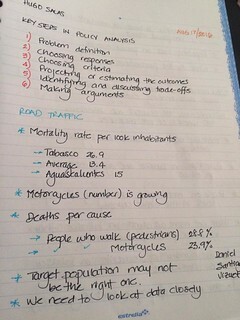 In particular, I note the topic or main theme in red ink, and then I use markers (asterisks, bullet points, arrows) to denote specific, important points. 3. I *always* take notes of everything, wherever I am and whatever I am doing. This is also funny for a lot of people. I see people at academic seminars, in class, or during faculty meetings who don’t bring a notebook with them. I trust my memory, but I trust my notes even more. 4. I use shorthand techniques to make my writing faster. When I was a child, I always thought of which tools and techniques I could “sell” (I wanted to be able to work and sustain myself even if my parents were no longer with me). So, I learned shorthand techniques (Gregg and Pitman), which were secretarial (administrative assistant) skills. I no longer write full sets of notes using Gregg shorthand, but I DO use some of their symbols. Also, I use abbreviations that make sense to me, like “w/” to mean “with”, “WRT” to mean “with respect to”, etc. 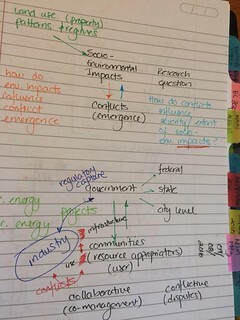 I also use arrows, bubbles, boxes and stars to build mind maps (more on that topic in a future blog post). Something people ask me often is if I take notes of journal articles, books and book chapters that I read. Doing so would seem repetitious and a waste of time for some people. Generally speaking, I scribble on the margins when I highlight a paper, and then I write a memo on it (directly in my computer). However, there are places where I read or take notes where I can’t use my laptop (e.g. when I’m waiting for my orthodontist to finish her appointment before mine). Thus, I do write notes about specific articles (see below for an example). The one thing I can surmise from all the reading I did for this post is – taking notes does require you to engage with the material and absorb it in a much more profound fashion (what my friend Dr. Daniel Goldberg indicated is metacognition), and thus there is a lot of value in note-taking. This post gives some good tips to synchronize note taking in a laptop with storage methods like Evernote. 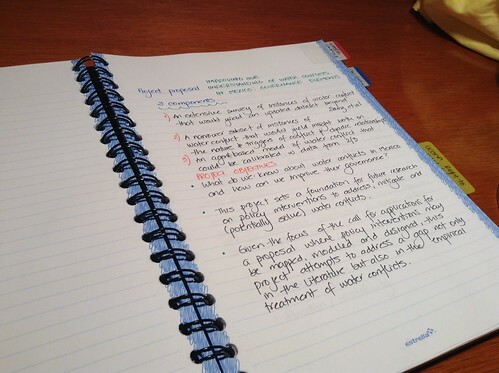 LifeHacker also has some good tips on note-taking. The Guardian also offers some back-to-school ideas on taking good notes, storing them and reviewing them. GradHacker offers some advice on note-taking, both with laptops and analog. ProfHacker has an entire set of blog posts with the tag “note-taking”. Yes, professors are obsessed with note-taking! I am not the exception to the norm. Tagged with handwriting, note-taking, studying.